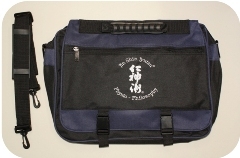 (15.5" x 12" x 2.5") Shoulder bag for all your practitioner needs! Perfect for carrying your Jin Shin Jyutsu class books and a laptop or small electronics! Inside has zipper pockets and slots for pens, pencils or business cards. Detachable and adjustable shoulder strap.